Here is a sneak peek at the new Renegade Diet Book. Obviously, if you have been following this blog you know that members of Jason’s Renegade Inner Circle have been using the Renegade Diet for months, and had incredible results. And in the next few days, Jason will finally be releasing his brand new diet to the public, so you can get in the best shape of your life. For those of you that are considering picking it up, I put together this review video to let you know what to expect. Please take a moment to check it out, and let me know what you think. 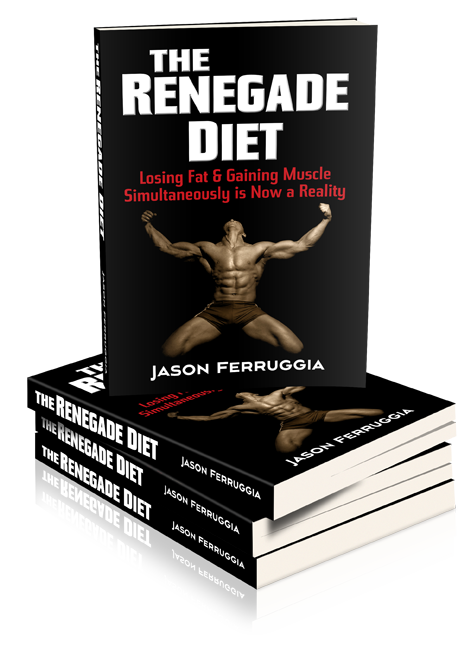 In this Youtube Video I will give you a complete review of the Jason Ferruggia’s new diet book. You will find out exactly what this new book is all about. You will also see several examples of people’s success using this new adaptation of intermittent fasting. Jason has modified the Warrior Diet, to maximize muscle gain and fat loss. I hope this review will give you the information you need to make an informed decision. There is a TON of information in this book, so much so that I have had to read it a couple times to totally digest it. It took quite awhile for me to be sold on the concept of intermittent fasting. However, from everyone I had talked to intermittent fasting works. And with Jason modifying it for muscle gain, this is a tremendous nutrition protocol. One of my favorite parts of the Renegade Diet is that Jason helps you GET HEALTHY. I can’t stress that enough, and surprisingly, that is something that a lot of dieting plans overlook. Once you get healthy, everything else becomes easier. The best part is that the Renegade Diet doesn’t even feel like a diet.